For information on memorials, see the bottom of this page. In 1875 the Western Times published an article on Non-conformity in Devonshire, claiming that in the Record Office in London there was a complete list of those licensed to preach in 1672. Those mentioned in connection with Ashburton are John Syms and Richard Tapper, both down as Presbyterians. *The Corn Laws, dating from 1804, placed a duty on imported grain. The measures were designed to help landowners, but they had the effect of keeping the price of bread high. The Baptist Chapel, Heavyhead Lane, erected 1798. Has 300 sittings. The Brethren have a room in North St. Will seat 150.They also have one near the Railway Station. A letter rebutting the allegations follows, written by Mr Pearse's daughter, Mrs Agnes Pearse, dated February 28, 1717/18, at Ashburton. Mr. Mead succeeds Mr. Pearse, who is then succeeded by Mr.Taylor in 1702. 'The present Independent Chapel, situated in North Street Ashburton, appears from the original trust deed to have been erected in 1739, on the site of a barn which had been converted into a meeting-house for the worship of God as early as 1712, it being so described in a deed of that date...from the deeds, the property appears to have originally belonged to Thomas Glanvill, of Exeter, fuller, and Thomas Sainthill, of Ashburton, clothier, who, November 15th, 1712, conveyed it to one John Comyn. 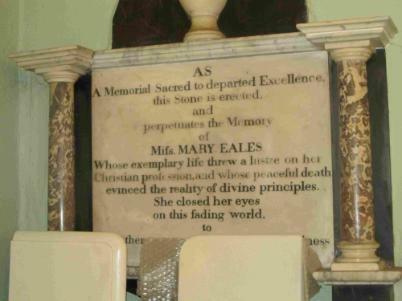 As a memorial sacred to departed excellence, this stone is erected and perpetuates the memory of Miss Mary Eales whose exemplary life threw a lustre on her Christian profession, and whose peaceful death evinced the reality of divine principles. 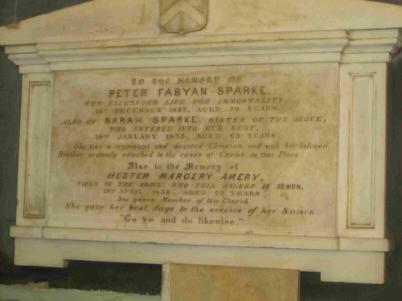 Right: To the memory of Peter Fabyan Sparke who exchanged life for immortality 16th December 1843, aged 70 years. 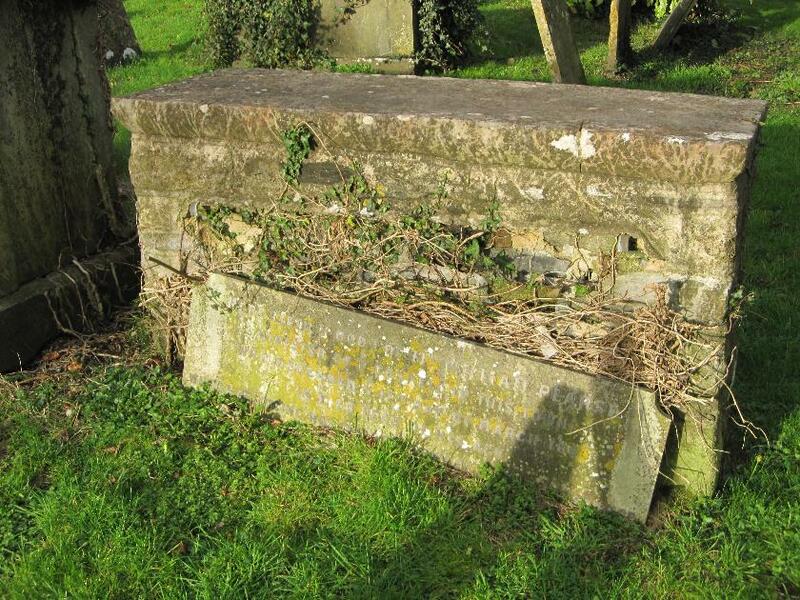 Also of Sarah Sparke, sister of the above, who entered into her rest 16th January 1839 aged 63 years. She was a consistent and devoted Christian and with her beloved brother ardently attached to the cause of Christ in this place. "Go ye and do likewise"
This stone was raised to preserve the memory of the Rev. John Nosworthy M A Ejected from the parish church of Manaton in this county, who in the year 1665 gathered a Christian Church in this place, and after great persecution entered into his rest 19th November 1677, aged 65 years. who after faithfully preaching the gospel here, died 17th March 1690, aged 65 years..
His remains rest in the Church Yard of this parish. 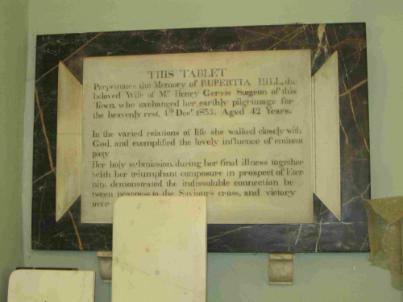 They had trials of cruel mockings and scourgings, yea, moreover of bonds and imprisonments..."
This tablet perpetuates the memory of Rupertia Hill, the beloved wife of Mr. Henry Gervis surgeon of this town, who exchanged her earthly pilgrimage for the heavenly rest 4th Decr 1835 aged 42 years. 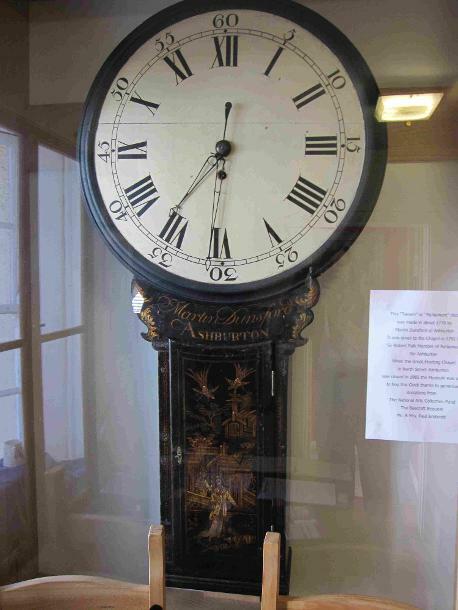 Right: The clock from the Congregational Chapel, now in Ashburton Museum. Made by Martin Dunsford, it was presented to the Chapel in 1791 by Sir Robert Palk (information from museum). Clocks such as these, large and sturdily built, are often called Tavern Clocks, as they were frequently to be found in inns and other buildings used by the public. In 1797, slightly later than the clock here, they acquired the name Parliament Clocks, after Parliament imposed a clock and watch tax. As a result, people stopped buying timepieces, relying instead on the clocks that inns and other places provided - many clockmakers went out of business during the brief time that the Act was in force. 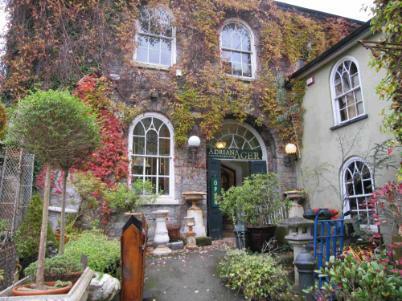 Notice that the Old or Independent Meeting House, in North Street, Ashburton, was on November 12th, 1838, registered for solemnizing marriages. The Southwest Heritage Trust holds a baptism register in the form of a small hardback notebook, ref 5103D/2. On the front cover is a label "Baptismal Register For the Independent Chapel Ashburton", and inside says that it is "a true copy of the Baptismal Register of the Independent Congregation of Dissenters Ashburton commencing April 20 1817 the whole was copied by me Lavington Evans. 1849. The Rev. S. Hebditch had greatly increased the congregation at the Independent Chapel. Amongst other things, he had begun a Young Mens' Improvement Society. A few months later a new school and lecture rooms were about to be built. 1849. A contract was awarded for the building of new lecture and school rooms in front of the 'Independent Chapel'. 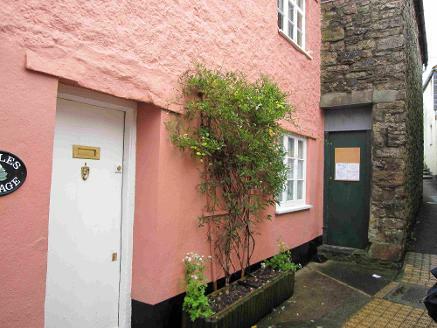 Mssrs Hext, Elliott and Eddy submitted the successful tender. In 1865 the wife of the Rev. John Gibson, for 'some months pastor of the Calvinistic church at Ashburton', was ill, and the couple were moving to the antipodes. A large number of people attended a tea held in his honour at the Independent Chapel, including members of the Amery and Berry families, the Honywills, Mr and Mrs Hern and G W Yolland. When Jonas Honeywill died in 1869 he was described as a 'prominent member' of the chapel. He was a maltster and brewer, and lived at Leet Park House. John S Spilsbury was an independent Minister at Uffculme, Devon, in the 1881 census. 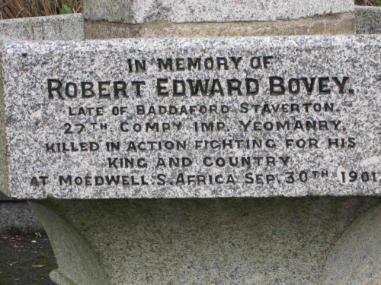 He was born 1821/22 Bedminster, Somerset. 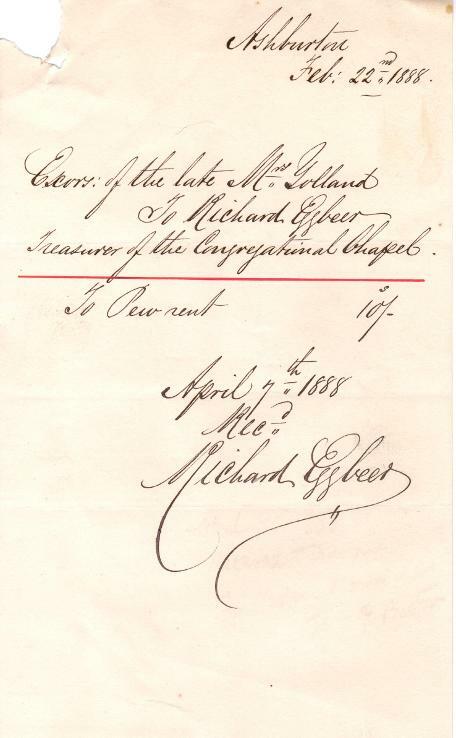 Left: A receipt to the executors of the late Mrs Yolland from Richard Eggbeer, treasurer of the Congregational Chapel, dated April 7th 1888. The executors had paid 10s (ten shillings) for rent of a pew. The Congregational Chapel underwent 'thorough' renovation in 1892, at an estimated cost of £450. Mr J H Pomroy was the builder. The roof timbers had been strengthened and a new ceiling erected, and the windows had been altered to a uniform height. Pitch pine seats replaced high pews, and heavy gallery fronts had been removed, together with the pulpit. Tinted glass had been installed in the windows. According to the Western Times, John Nosworthy founded the chapel in a barn in 1665. Hugh Stowell, Lord of the Manor and an MP, persecuted the congregation - presumably the Mr Stawell written about in the Congregational Magazine above. 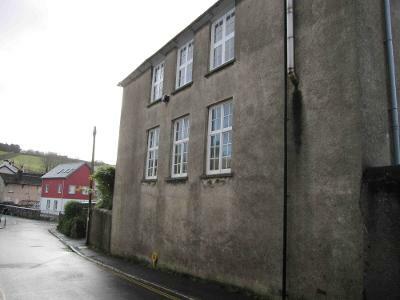 The schoolrooms were added in 1850. The Rev T N Oliphant was moving from Ashburton to Kirkstall, near Leeds, in 1895. He had been pastor at Ashburton for 13 years. The Rev J C Hodge, from Hawes in Yorkshire, became pastor of the Congregational Church in 1904. In 1909 Kenneth Evans and Miss C E T Reid (of Exeter) married at the Chapel. The groom was the son of Mr D O Evans, of the Medical Hall, Ashburton. The wedding party arrived in motor cars, and the couple also left for their honeymoon in a motor car. In 1926 the church had been without a pastor for 3 years. The Rev W Henrik Jones, formerly of Staple Hill Congregational Church, Bristol, took up the post in June. 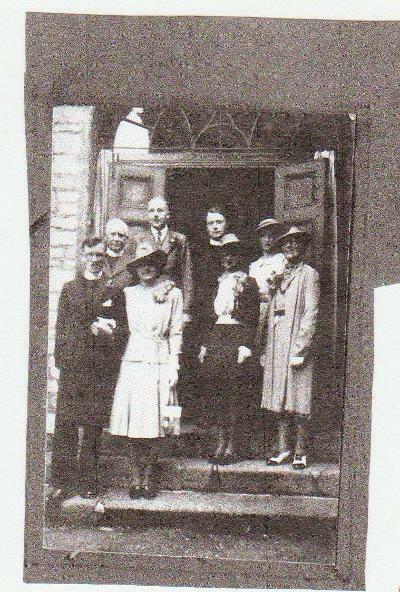 1933 Induction of the Rev H F Hawkes as Pastor of Ashburton Congregational Church. 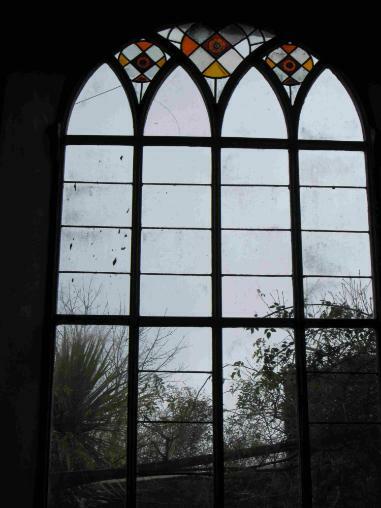 In 1934 a 17th century window was placed in the Congregational Church, in memory of the two Amery brothers. The Rev H F Hawkes took part in the unveiling ceremony, as did a former minister of the church, the Rev J Barton Lee, then Archdeacon of Exeter. In the 1939 register James R F Todd was a theological student in Shepton Mallet, who had finished his course and was awaiting ordination. He was in the same household as [his father] Robert, a Congregational minister. In August 1941 James Rogers Fleming Todd BA BD married Winifred Patience Statham at the Congregational Church, with the Rev R Todd officiating. The bride was given away by her mother. James had been inducted into the Ashburton Congregational Church ministry the previous Tuesday. Many thanks to Mike Todd for both photographs, who adds that the couple held their reception at Barnes' Café. Rev Todd officiated at the funeral for Miss Bertha Manlove in September 1941. Aged 83 and from Moorlawn, Miss Manlove had been a 'prominent member' of the Congregational Church, as well as being a member of the Devonshire Association. By October 1942 the Rev J R F Todd was librarian for the Ashburton branch of the Devon County Library. Mrs Todd, wife of the Congregational minister, read one of the lessons at Ashburton's first Women's World Day of prayer. 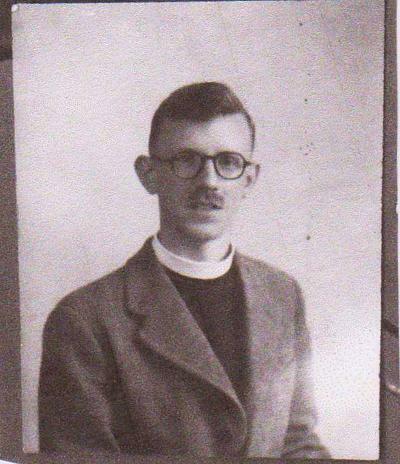 The Rev J R F Todd resigned from Ashburton in September 1943. He was about to become a chaplain at Hibbert Houses in the Middle East serving H M forces. Hibbert Houses were intended to provide a calm and homely environment for all members of H M forces, under the auspices of the Unitarian and Free Christian General Assembly. 1951 The Chapel Trustees are shown as the owner/occupiers of the Congregational Chapel, per J Langler, 32, East Street, Ashburton. 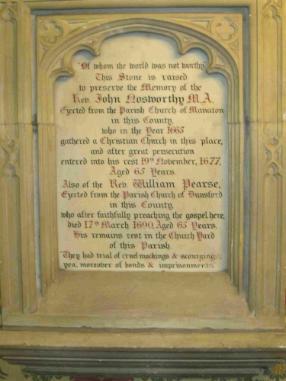 In 1914 the death of John Hern of Chuley, a member of the Plymouth Brethren, was announced. A cyder manufacturer, John Hern was 83 at the time of the 1911 census. He was by this time totally blind. A widower, he was living at Chuley House with his three unmarried daughters, one of whom, Lydia, was a private school teacher. Caroline Lucy Hern aged 79 died in 1938, the 'eldest surviving daughter' of Mr and Mrs Hern. She died at Chuleigh, which had been the family home for four generations. Mr A Palk of the Ashburton Brethren conducted the first part of the funeral service at the house. Ashburton, The Dartmoor Town, Francis Pilkington, Devon Books, 1978 p 36 of the 1989 ed. Meanwhile the Chapel became a wood store for about 50 years. In 2009 it was purchased by the Quakers, was renovated in 2012. 1881 Eleven people connected with the Zion Chapel were baptized by immersion at Chuley Orchard. Five or six hundred people went to watch. 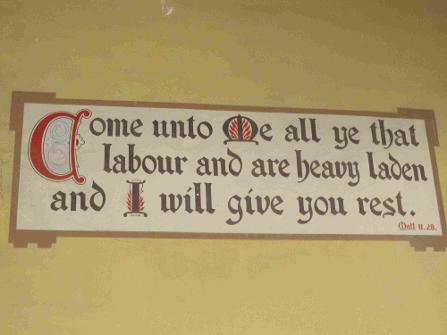 As the Hern family were connected to both Chuley Orchard and the Plymouth Brethren, I suspect that there is a connection between the Zion Chapel and the Plymouth Brethren. 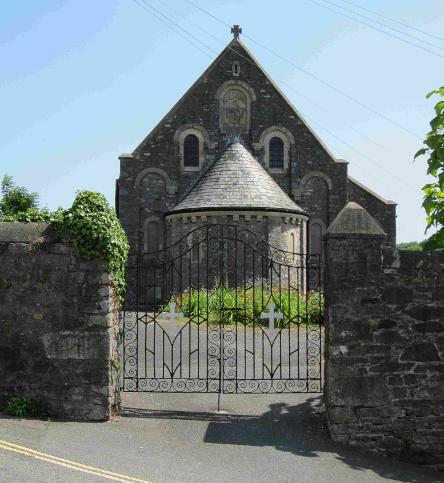 The Chapel, originally cottages, was used by the Plymouth Brethren in the late 1800s. It features in the 1891 census and in 1896 there is a newspaper report of a conference of Plymouth Brethren superintendents and teachers at Ashburton, with dinner and tea laid on in the Chapel. Above: The old Baptist Chapel, Woodland Rd. The Baptist Chapel was built in Heavyhead Lane (now Woodland Road) in 1798 and is the large building opposite No 19 Woodland Road. In the same year a lecture on teetotalism was given at the Old Baptist Chapel, lent by the Rev.W. Marsh. The Chapel was now an Infants' School. 1841 The children of the Baptist Sunday School had a special tea to celebrate the anniversary of the emancipation of the West Indian slaves. 1850 The Rev John Dore, the Rev Saml Hebditch and the Rev Charles Tippett were all stated as 'Baptist' in Ashburton. 1893 Ten candidates underwent baptism by immersion. Mr Mogridge of Torquay conducted the service. When the Rev P Chas Poley became the Baptist minister in 1900, he was the first 'settled pastor' for some years. There had not even been services until shortly before his appointment. The arrangements were made through the family of Mlle Delacote, who had 'wonderful vocal powers'. This suggests she had some connection with the Heron-Mason family below. According to D John Stephan, the mass took place in a garret in Roborough Lane, 'the premises being placed at [the Abbot's] disposal by the late Mrs Herring-Mason'. 3 years later, in 1914, a temporary chapel was established. When Agnes Ida Warren Vernon died, her obituary said that 3 years previously she had helped 'very generously' in the building of the new Roman Catholic Church in Ashburton. At the top of East Street at The Wilderness lived the Heron-Mason family, father, mother and two daughters. One of the girls had a beautiful soprano voice and became a singer in the D’Oyly Carte theatre company. The only way Ashburton people could hear her sing was to go to the children’s Sunday School in the Catholic Church, which in those days was an old army hut situated in Roborough Lane in what is now Ashburn Gardens. Women said this lovely young girl walked up and down the aisle swinging her Rosary and singing “Ave Maria” or other sacred hymns; 'Her voice was angelic', said one listener. 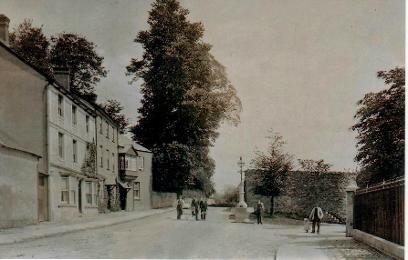 Right and below: The Bovey Memorial Fountain, now by the side of the Bay Horse Inn, North Street, but originally on the site of the War Memorial in East Street. From my own collection. The modern photograph below is my own.